Rescheduled for launch in summer 2011. Built by Loral. 130Gbps capacity. 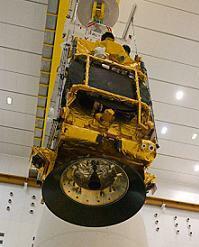 Yahsat 1A and Intelsat New Dawn launched successfully April 22 2011. The launch was scrubbed previously on March 30th. The Ariane launch vehicle suffered a pad abort after main engine ignition, scrubbing the attempt. The vehicle will now have to be rolled back at the the European Spaceport in Kourou, French Guiana before the next attempt. Yahsat 1A launch was also previously delayed due to the earthquake in Italy last April. The 15KW satellite will be at 52.5E and has 21 Ka-Band Transonders as well as 14 C-Band and 20 Ku-band transponders. Yahsat 1B will follow within months of the 1A launch. KA-SAT, the first High Throughput Satellite (HTS) in Europe, marks a new generation of multi-spotbeam high-capacity satellites. Built for Eutelsat by EADS Astrium, KA-SAT’s revolutionary concept is based on a payload with 82 narrow Ka-band spotbeams connected to a network of ten ground stations. This configuration enables frequencies to be reused 20 times and takes total throughput to beyond 70 Gbps. The ground network uses ViaSat’s SurfBeam® technology, similar to the solution powering broadband connectivity for almost 450,000 satellite homes in North America. The combination of KA-SAT’s exceptional capacity and ViaSat’s SurfBeam® technology will make it possible to deliver Internet connectivity for more than one million homes, at speeds comparable to ADSL. Eutelsat's KA-Sat launched succesfully on December 26th 2010. The satellite will provide broadband Internet access services across Europe and also a small area of the Middle East. The satellite has 14kW of power. The Solar array provides 16kW. Located at 9°E, it has 82 , 237MHz wide, spotbeams each allowing a data througput of 475 Mbps for a total of almost 40 Gbps. Avanti's first satellite, called HYLAS 1, launched on 26 November 2010 and is the first superfast broadband satellite launched in Europe. It is located at 33.5W offering Ka-Band spot beams to UK, Spain and Eastern Europe. Hughes’ Jupiter satellite scheduled for launch in 2012. This will be a high throughput satellite in the region of 130Gbps, very similar to Viasat-1. 21806 visits to this page since 28 Nov 2012.